Annawadi is a makeshift settlement in the shadow of luxury hotels near the Mumbai airport, and as India starts to prosper, Annawadians are electric with hope. Abdul, a reflective and enterprising Muslim teenager, sees "a fortune beyond counting" in the recyclable garbage that richer people throw away. Asha, a woman of formidable wit and deep scars from a childhood in rural poverty, has identified an alternate route to the middle class: political corruption. With a little luck, her sensitive, beautiful daughter--Annawadi's "most-everything girl"--will soon become its first female college graduate. And even the poorest Annawadians, like Kalu, a fifteen-year-old scrap-metal thief, believe themselves inching closer to the good lives and good times they call "the full enjoy." 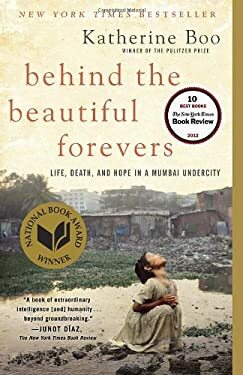 With intelligence, humor, and deep insight into what connects human beings to one another in an era of tumultuous change, "Behind the Beautiful Forevers "carries the reader headlong into one of the twenty-first century's hidden worlds, and into the lives of people impossible to forget.